As mentioned in the previous post, I am currently going through a home renovation (an experience which I am hating). This means that I am spending quite some time reading interior design books. 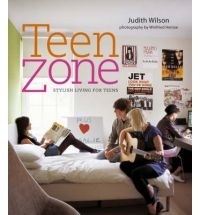 One that has been a favourite for many years is Judith Wilson’s Teen Zone. I find the spaces interesting and inspiring. However, neither of my sons like anything in the book. I’m not sure if this is indicative of adults writing for teens but missing the point or that my boys just want to play cricket and won’t humour me.